Too many boards rely on outdated and onerous board evaluation methods to stay relevant and effective in an increasingly turbulent environment. In this white paper, we highlight insights from research around the globe and reveal the seven hallmarks of effective boards who are managing to meet the challenges of business in the 21st-century head-on. AltoPartners is proud to partner with Better Boards, an organisation credited with creating next-level board evaluation tools designed to motivate and inspire. Companies and their leadership are under more public scrutiny than ever before. Shareholder activism is on the rise, demanding new levels of accountability and transparency in a bid to ensure that organisations meet core performance targets in ethical and sustainable ways. 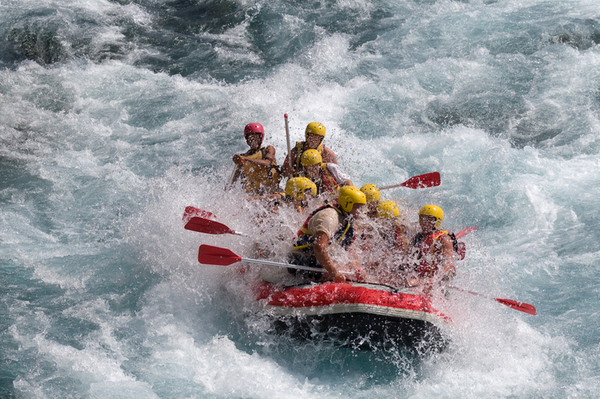 It’s a tough call in an increasingly disruptive and volatile global economy, and there is a premium on directors who can help navigate choppy waters and future-proof their organisations against a rising tide of risk and uncertainty. While it’s clear that boards are aware of the need for change, many are in a state of flux, unsure of how to tackle 21st-century problems using a governance framework rooted in the 1930s. Recent research conducted by Better Boards has shown that effective boards share common traits that cut across size, geography and sector, providing a useful bellwether for organisations wishing to optimise board performance. The traits apply equally to supervisory and management boards such as those common in countries who have a two-tier board structure like Germany, as well as unitary boards popular in the United States and the United Kingdom. Globally, we have seen a rise in the number of clients actively seeking to transform their boards by making them more inclusive and diverse, often recruiting directors from other sectors of the economy in a bid to widen perspectives. But in the absence of effective rules of engagement, all the diversity in the world won’t help if the independence of thought isn’t prised and healthy debate is stifled. Hardly surprising then that chairs who actively promote collaboration and insist upon independent viewpoints are highly prised as they are key to ensuring that board meetings do not become echo-chambers in which directors simply reinforce groupthink. Our conversations also revealed the need for a different approach to board evaluations and reviews. There is a universal dislike of box-ticking exercises which are viewed as time-consuming and increasingly irrelevant. What’s urgently needed is a collaborative tool that helps boards focus and align around top priorities, while fostering greater agility and speed in decision-making. To create value amid complexity, boards need new guiding principles and practical tools derived from research and hard data, not custom and anecdote. From an executive search perspective, we are seeing a clear trend towards structured, exclusive supervisory board searches in the public and private sectors with a mandate to find board members with the right mix of diverse and complementary competence and experience, often not found in the immediate peer group. In the public sector, where board members were traditionally selected by political decision-makers, there is a clear trend towards searching for independent (supervisory) board members and board members who add value. New conversations need to be had – ones that value independent views and opinions and deliberately challenge groupthink. Bringing governance to life in the 21st century means equipping directors to gain insights into the variables that matter; insights that provide the foundation for the flexibility to respond appropriately to ever-changing threats and opportunities. At the heart of this is the ability to foster spirited internal debate and effective boards go to great lengths to build the requisite levels of expertise, trust and confidence to promote independent thought. While all boards are different, and one size most certainly does not fit all, this paper sets out the seven hallmarks of effective boards characteristics that differentiate the best from the rest. Engaged and effective boards are a complementary mixture of different skills, expertise, business experiences, perspectives, personalities, and behavioural styles. They’ve shed the homogeneity that leads to groupthink and reinforces shared biases. Adequate for simpler times, socially insular boards lack the versatility to handle complex new challenges. But our research confirms that diversity should go beyond adding women or minority group members to the board. Equally important is diversity of professional experience, subject-matter expertise, and “role behaviours” that underpin boardroom dynamics. Boards perform better when they take full advantage of each member’s distinct strengths and personality traits. That means each director must understand what he or she brings to the table, and how it fits in with the strengths and behavioural roles of all the others. Effective boards conduct exercises to discover the traits and talents of each director, a process that reveals capability gaps and helps determine which members should play leading roles in various board activities. In our practice, we’ve seen how this process energises a board and even spills over into management. Directors who know their unique capabilities and understand their specific roles show greater confidence in their decision-making and embrace change more readily. Boards that discern and capitalise on the strengths of each member execute strategy more effectively, and get better results from large-scale transformation programmes. Directors who feel appreciated for their strength in the boardroom display greater confidence in their decision-making. Recently, we worked with a high-profile board that was frustrated by the organisation’s inability to resolve repeated customer service failures that were generating bad publicity and hammering the company’s stock. Try as they might, directors couldn’t bring their world-class capabilities to bear in a meaningful way. We advised them to break down the challenges into discrete components and identify the board members who could help managers solve each separate problem. We created a strength matrix that provided insights into who was best placed to resolve each separate issue. Ill-defined roles and unclear responsibilities—all too common among today’s boards—leave directors unprepared to act effectively and unable to ensure that strategy is translated into execution and value-creation. An engaged and effective board assigns clear roles and responsibilities to every member, consistent with their distinctive strengths, abilities, and characteristics. A director with overseas business experience might take responsibility for overseeing a company’s foreign operations, while a technologist might help management develop a digitisation strategy. Boards should re-evaluate assignments regularly and revise or add roles as changing conditions dictate. Duties also change when members join or leave the board. For example, when a top-flight financial executive joined the board of a leading company, she was assigned to lead the audit committee. The previous audit chair, an experienced HR executive, took on a new role helping the company develop a new philosophy on restructuring. Most boards will tell you they have a common strategic vision for the company. Ask each member to articulate that vision, however, and you’ll likely get as many different versions as there are directors. A board that doesn’t agree on where it’s going will have a hard time getting anywhere. In a recent assignment, we found that incompatible interpretations of strategic goals were preventing directors from reaching agreement on certain important issues. Effective boards allow no such strategic ambiguity. They align around a single vision and spell it out enough to guide board decisions and spur directors to action. They make sure the vision is understood not only by all board members but also by managers at least two levels down the organisational chart. Conflicts inevitably arise between corporate boards and the management teams they oversee. Often these conflicts erupt during a crisis—a strike by company workers, perhaps—that calls for a rapid, unified response. If the board and management can’t coalesce quickly, the situation may spiral out of control. Effective boards establish ground rules and mechanisms for resolving conflicts with management. Often, they designate a director with relevant expertise to work directly with executives in times of conflict. Effective boards establish ground rules and mechanisms for resolving conflicts with management. Consider the case of a large company hit by a strike that interrupted deliveries and angered customers who relied on the company for daily service delivery. After the labour impasse had dragged on for several months, two directors with proven conflict resolution skills began working with management to find a solution. Within weeks, a settlement was on the table. Well-designed organisational structures and working processes enable boards to act efficiently and effectively, while poor structures and working processes can lead to paralysis. 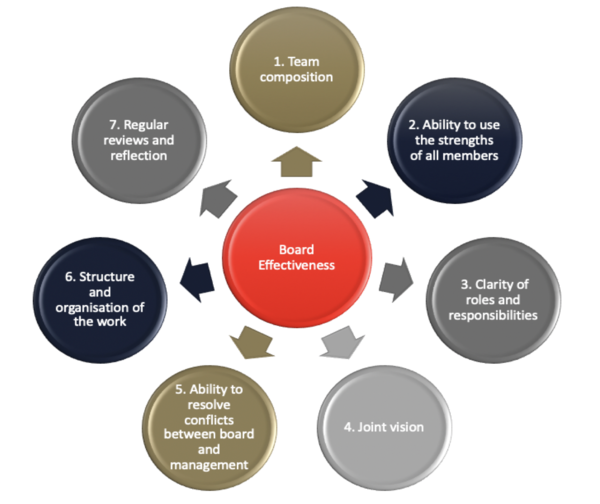 Effective boards understand that organisational effectiveness starts with a smooth operating relationship between the company secretary, the Chairperson, and the CEO. They lay out a detailed road map for the year, a clear agenda for each meeting, and ground rules for boardroom interactions. They also thoughtfully schedule board work and meetings, aligned with the strategy and challenges facing the organisation. Simply adopting a new set of operating principles won’t assure consistently superior board performance over the long term. Effective boards take stock of themselves regularly, scheduling formal sessions to measure their performance against agreed-upon goals and benchmarks. They discuss what works and what doesn’t, and consider new ways of improving their performance. Equally important are informal gatherings, where board members can connect on a personal level and gain perspective on their work (see sidebar: A Five-Step Action Plan for Better Boards). Changing the dynamics of a board room can be a daunting task. While the Seven Hallmarks provide a positive framework within which to begin the conversation, a board will need to devise an action plan to reach their governance goals. Successful board audits and board development initiatives start with an in-depth understanding of the company’s strategy and value creation plans. These broader imperatives guide a fit-for-purpose board design tailored to company goals. In working with clients, we have seen first-hand how integrating board development with company-wide transformation, and strategic execution programmes can accelerate change and deliver greater value. Step 2: Get the evidence. Evidence-based governance models require data and lots of it. Board development programmes that don’t gather enough data on the issues most pertinent to effective governance tend to create structures and processes that don’t improve performance. Successful transformations, by contrast, collect all the relevant data needed to build engaged and effective boards that achieve results. Step 3: Provide directors with real insight. Directors are time-pressed executives with little patience for undifferentiated, time- consuming data collection and abstract analysis. Board Evaluation, Review and Development programmes engage their attention and win their support by distilling evidence down to key data points that lead to concrete, specific, and actionable insights relevant to the role of each director. Step 4: Give individual feedback in a neutral and confidential environment. Agree on a framework and work at it. Use consistent data collection mechanisms to track progress and evolving patterns over time. This longitudinal insight forms a foundation for continuous learning by directors and senior management. © 2019, Dr Sabine Dembkowski, BetterBoards Limited, in collaboration with AltoPartners C.V. All rights reserved.